The dessert - meringue with fruit and cream - was named after the Russian ballerina Anna Pavlova, who visited both countries in the 1920s. 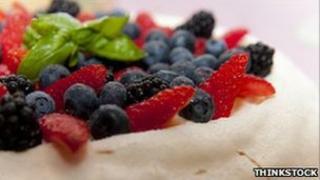 Dr Helen Leach from New Zealand's University of Otago is something of a pavlova expert. "I can find at least 21 pavlova recipes in New Zealand cookbooks by 1940, which was the year the first Australian ones appeared," the author of The Pavlova Story told the Daily Telegraph. "Linguistically it probably isn't that important," the OED's Fiona Macpherson said about the pavlova ruling. "We have to be neutral about this kind of thing, we're just interested in where we can get the evidence and what it actually means." But she told the BBC: "It probably does matter, at least if you're from Australia or New Zealand - it's nice to think that you might have coined or created something." In fact, although the OED credits the first written record of the recipe to New Zealand, it lists the origin, rather ambiguously, as "Austral. and N.Z." So a ruling has been made, but the debate may well continue.